The Lily necklace is both modern yet classic and delicate. A single white Swarovski pearl and silver crystal are all that is needed to make this a very special piece to wear time and time again. 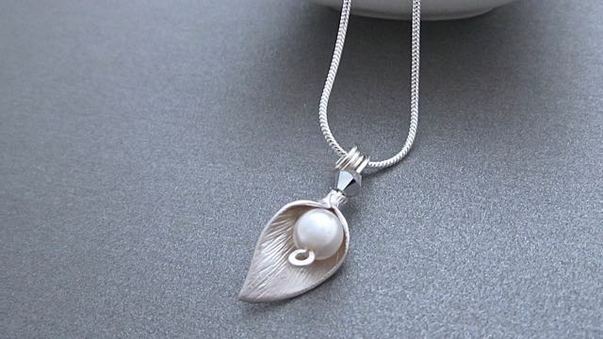 The pendant is hung on a sterling silver snake chain. DIMENSIONS – The Lily pendant measures 20mm with a total drop of approximately 28mm. The widest point is 11mm. These Lily earrings are sweet and delicate. A white Swarovski pearl and silver crystal are all that is needed to make these very special to wear time and time again. 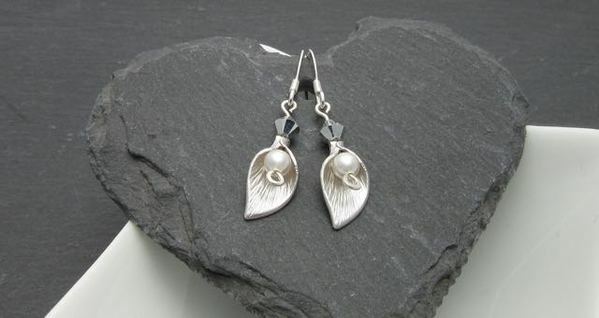 They are on silver sterling ear hooks, and are left free to swing slightly as they are worn. DIMENSIONS – The total length of these earrings is approximately 20mm. The lily's widest point is 8mm.